While most people think they can make their home more energy efficient without the help of a professional—and they can—it cannot be denied that the training, experience, and skills of an expert HVAC and roofing technician is necessary to get the best out of any energy solutions project. Here are three top reasons why dealing with us at Green Air is still necessary despite the prevalence of energy-saving tools at your disposal. We bring a wealth of experience and a deep passion for our customers’ satisfaction to every project, treating you with the same level of care and concern as we would our own family. From day one, our focus has always been on the customer as a whole, which reflects our commitment to bringing you the highest-quality HVAC and roofing energy solutions at all times. Our HVAC and roofing technicians are respectful and fully committed to giving you the personal attention you deserve. Our people make it a point get to know you well, encouraging you to actively participate in decisions that relate to your HVAC and roofing needs. We also focus on team-based training to support and broaden the knowledge of our people. We partner with the best names in the business to provide the best quality products in the industry. We believe that by working only with the best, we are better equipped to provide unmatched quality service to our customers. We believe that by providing high quality service and products, we help improve the quality of life of our customers. 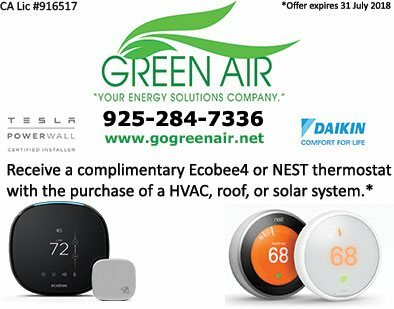 In Concord, CA and surrounding communities, call Green Air at (925) 62-SOLAR or (925) 28-GREEN or complete our contact form to reach us and discuss what it’ll take to bring you the energy-efficient HVAC or roofing experience that you deserve.